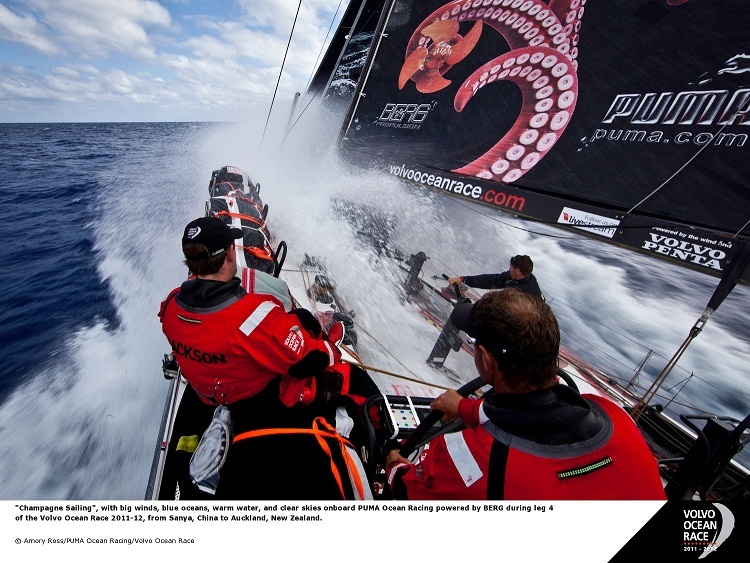 CAMPER with Emirates Team New Zealand set the bar at 554.16 nm during Leg 1 from Alicante to Cape Town, but as the six teams power south through the Pacific Ocean trade winds the record could tumble. 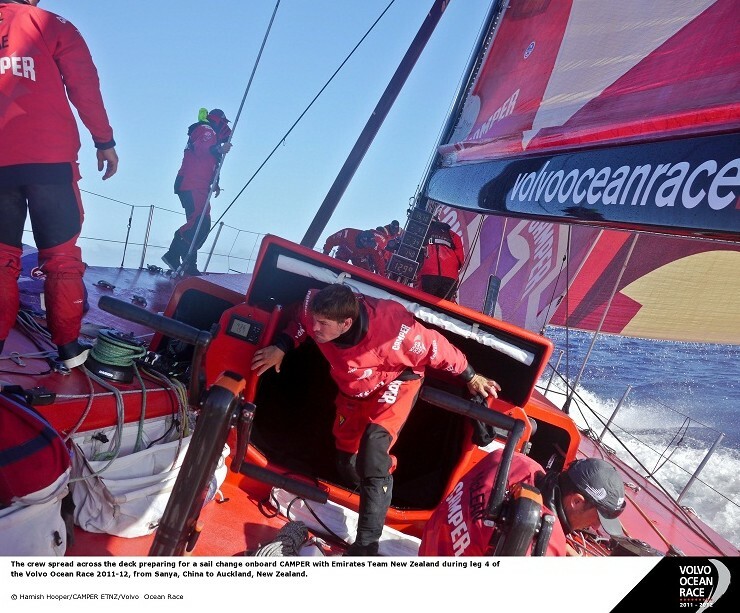 Volvo Ocean Race chief meteorologist Gonzalo Infante said the latest weather and routing models suggest that several of the teams stand a chance of bettering CAMPER record over the next few days — particularly those able to sail wider angles in the east. It’s going to be very close but it very possible the record could fall in the next few days, Infante said. The arrival of the solid north-easterly trade winds benefitted the easterly boats first with leg leaders Franck Cammas, Groupama sailing team extending their advantage at the front to 55 nautical miles (nm) in the 1300 UTC position report. To the west of the fleet Chris Nicholson second placed CAMPER and Iker Martez third placed Team Telefonica continue to struggle to match the speeds of the trio in the east. Ken Read PUMA Ocean Racing powered by BERG and Ian Walker Abu Dhabi Ocean Racing who have both clocked up peak speeds over 25 knots. 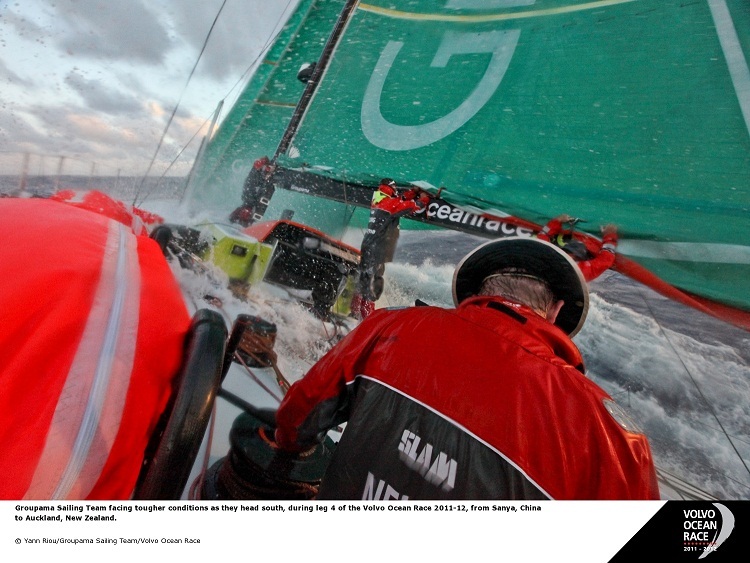 Finally it feels like the Volvo Ocean Race,?Walker said. or more drifting around or upwind sailing — just raw power, soaking decks and high speeds. Fortunately all the easting we have strived for over the past week allows us to sail as wide an angle as we are. The wind is 25 knots and building. Boat speeds fluctuate between 18 and 30 knots. The miles to the finish are now tumbling fast which makes the soaking on deck well worth it. It’s been fantastic, fast reaching, Addis said. ee back in open water, no shipping, no fishing nets, no debris to dodge. They just letting the boat rip doing 22, 23 knots, reaching with bow up. It what these boats are good at so that’s always a nice feeling. Addis added that PUMA were aware that they must keep up their breakneck pace for the next few days if their northern further but faster, strategy was ultimately to work. Spportunity is ahead for us starting from now, for sure, especially after all our hard work to get east, he said. After all this torture wee going to finally have wider and faster angles than most of the guys, so we should be gaining by the hour. Wee put in the hard work, and now it time to reap the rewards. Then you travel the most miles in a leg like we have, I guess youre got to expect to put some good runs on the board. We had 26 knots earlier, we may get close again but it’s likely to just average 20 knots plus. They worked very hard through the change of positions to be among the pack, wee led at times and wee been last at times, but now wee faced with the reality of the speed of these new generation boats, Sanderson said. heye going in excess of a knot faster than us, and theye just going to sail on by. They all very competitive sailors and wee all used to winning, but now wee just not fast enough through the water after battling for the last week to keep up. Tne knot difference is big youe talking a 24-mile difference each day. Over the next three or four days with the trades, it’s a little bit scary. It’s going to be 100 miles in those three or four days.